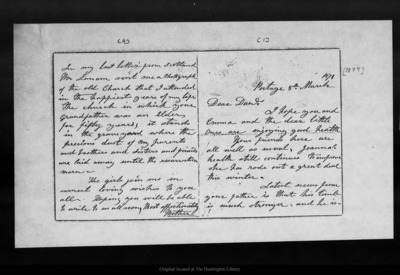 Letter from [Ann G. Muir] to Dan[iel H. Muir],  Mar 8. Some letters written to John Muir may be protected by the U.S. Copyright Law (Title 17, U.S.C.). Transmission or reproduction of materials protected by copyright beyond that allowed by fair use requires the written permission of the copyright owners. Responsibility for any use rests exclusively with the user. The Huntington Library. Please contact this institution directly to obtain copies of the images or permission to publish or use them beyond educational purposes.